- Do you enjoy fried foods like French fries, bacon, chicken, steak, onion rings and more, but hate the mess? - Even worse, are you concerned about your safety? Hot oil can burn your skin and damage your eyes. With the Zulay Kitchen Splatter Screen, you can fry the delicious food you want and stay safe and clean. You can have it all! Just keep this spatter guard handy in your cooking area at all times, and you?re protected. 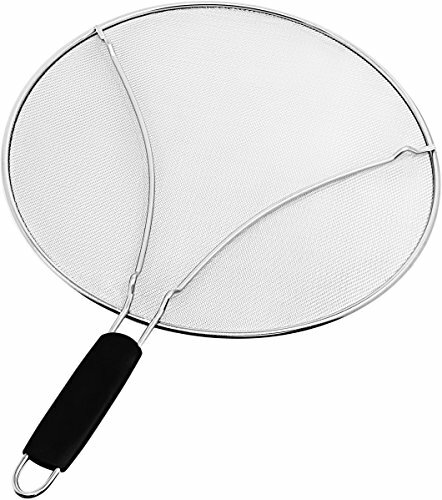 Oil and grease will be trapped in the skillet or wok by our extra fine mesh grease catcher. Steam escapes, ensuring that your food is actually fried and not steamed, as it would be if using a lid. Your stove top, counter, walls and your clothes will be kept clean. With the convenient hook holder, you can hang it easily nearby. Completely flat design means it can be stored in any narrow area, or in a drawer. And with the resting feet, you can set it on the counter without worry. The plastic silicone like handle and the design of the shield will ensure that heat is never transferred to your hands. No blisters like with come cheap, disposable screens with metal handles. Works on every type of cookware? Pot, cast iron pan, non-stick pan, Dutch oven, and professional stainless steel, big and small. Use in the kitchen or on the grill. Not for use in the microwave. Use as a strainer for pasta, vegetables, dumplings, stew, and more. You can also use as a cooling rack for cookies, bread, cupcakes, etc. We believe in our products! If for any reason you are not fully satisfied, just let us know, and we will give you a full refund, no questions asked. KEEPS YOU SAFE When you're frying bacon, onions, chicken, anything really, hot grease and oil can fly out of the pan and get things very messy, plus you can burn your skin or even your eyes. Be clean and safe with our grease catcher splatter guard that stops almost 100% of splatter and mist, while letting the steam out. Great for deep frying, wok stir fry and more. REDUCES MESSES BY ALMOST 100% Our splash guard keeps oil, bacon grease, butter, odor, and food particles in the frypan where they belong. You'll spend less time cleaning up the stove and surrounding area AND yourself, as this screen is super effective, more so than other competitors. Our splatter screen and guard is dishwasher safe for easy and fast clean up. Also works as a strainer, sieve, and cooling rack. STURDY LONG LASTING CONSTRUCTION Stainless steel means our cover will stand up to heat and abuse for a long time, absorbing sauce and fat. Heavy duty BPA free materials will not rust, discolor, or warp. Easy clean and dishwasher safe. ERGONOMIC DESIGN Comfortable plastic handle keeps you protected from heat while giving a firm and secure grip on the frying pan splatter guard. The four resting feet mean you can put the frying mesh on the counter without getting grease everywhere. Convenient hook makes for easy storage. LIFETIME GUARANTEE As with all of our products, we stand behind our anti splatter guards with the best warranty in the industry, a full money back guarantee. If the pan cover doesn't live up to your expectations, contact us and we'll provide a full refund, or replacement.